Wow! 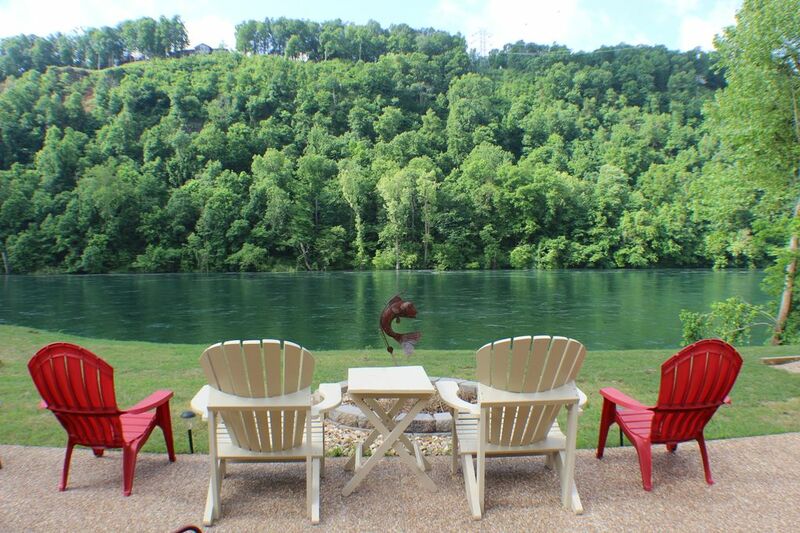 Stunning river front home located between Bull Shoals Dam & Gaston's restaurant. This river home features three bedrooms and two baths with over 2100 square feet of living space plus a screen-in porch and open patio .White Riverfront Retreat is located in North Central Arkansas just below Bull Shoals Dam, Mid-America largest. Relax & Enjoy the breathtaking views of the cool crystal clear waters of the White River! The trout fishing is some of the best in the country with bank & wade fishing below the home or drift fishing with a guide for an experience of a lifetime. You can rent a boat or enjoy kayaking or canoeing for a fun day. Enjoy the rustic decor with hardwood flooring and several fish and game mounts for the full experience of the Ozarks. Our home is ideal for the family vacation with over an acre of land for the kids to play, the guys fishing trip or even the girls getaway. We also have nearby hiking and biking trails for the more active lifestyle. If you love the outdoors the bird watching will amaze you without leaving the property. From the back patio you can enjoy watching the fishermen drift by hoping for a tug on their line or relax and play a game of horseshoes and see who’s champion for the day. As night time approaches be sure to watch the fog roll-in, it’s magnificent especially with a nice bonfire roasting marshmallows for kids or even grown-ups. If you’re looking for a great experience to create memories of a lifetime give us a call you won’t be disappointed. You can also enjoy a day on beautiful Bull Shoals Lake that is only 5 minutes away. Rent a pontoon boat or bring your own boat to swim, water-ski ,wake-board or just relax and enjoy nature with very little boat traffic great for the beginner. Like to scuba dive Bull Shoals lake has good visibility to spear fish or view the underwater treasures. We have both grew up in the Bull Shoals Lake/White River Area and our passion has always been to live on the White River. The more time you spend on the river the more you appreciate the captivating river views. We didn't realize how much wildlife there is and how it changes every minute. One minute the trout will be jumping right in front of you, next a blue hereon flying by followed by beavers making their way to their favorite tree and final the local eagle searching for the next meal. I can't tell you how many times we've seen an eagle diving for a trout. The only way to truly appreciate the river is being there in person. We love it so much we've decided to build our forever home just down the street. THE BEST OF BOTH WORLDS!! White Riverfront Retreat is ideally located on the White River with Bull Shoals Lake just 5 minutes away. The incredible views of the White River and the every changing wildlife scenes change by the minute are absolutely breathe taking. In the evening the fog rolling in changes the entire experience. Enjoy gathering on the patio grilling your favorite meal or have a bonfire roasting marshmallows. The open floor plan is ideal for groups along with the river room & screened-in porch. Our families have enjoyed many holidays and birthdays at the home and it's perfect! Located in one of the best areas to fish on the White River between the State Park and Gaston's Resort. Plenty of room for a big group. Very clean and modern. Recommendations to the Owner: A new garden hose would help for cleaning mud off shoes. Pots, pans and baking sheets are in bad shape. Our family had a wonderful time! Great river front home that was so tranquil! We loved the River house. The decor is tastefully done in "river fishing" art and furnishings. The house was very comfortable and roomy. The patio overlooking the river was nice, including a fire pit. The two back porches (all-season / seasonal) gave us plenty of room to spread out. The kitchen, dining rrom, family room and bedrooms were functional and nicely decorated. Lastly, our host was accomodating and eager to make sure we enjoyed our stay. Definitely 5 - star!!! Thanks for staying with us! So glad you liked our accommodations. It was nice to see the fish that you guys caught as well and glad you enjoyed the shoot range to brush up on you skills too. I'm glad "river" your dog like the property as well. Cheers, hope to see you again. We thoroughly enjoyed our stay at the River House. The patio, and both back porches (all-weather and outdoor) were very comfortable and gave us plenty of room to spread out. The kitchen, dining and family rooms were nicely decorated in "fisherman" design - very cool! The owner was very accommodating and made sure we had an enjoyable visit. Definitely 5-star! We really enjoyed our stay and will consider it again if we are in the area. Everything was there to make our time enjoyable. We would highly recommend this to anyone. The rental had everything we needed and more. The kids were able to use the expansive yard to play soccer and just run around and explore. The outdoor area overlooking the river was even better in person. The fishing was solid right behind the house... Find the tree stump sticking out of the water across the river and work your way 50 yards up and 100 down. We also took a guide out recommended by the property owners which allowed our two girls to land plenty of trout we took to Gastons for dinner a few minutes down the road from the house. * The White River is a crystal clear river with some of the best trout fishing in the country. We offer bank & wade fishing or if your looking for a trip of the a lifetime let us know and we can refer a guide for an amazing day on the river catching fish, cooking shore lunches from your catch of the day and viewing wildlife like you've never seen. If you like kayaking or canoeing the river is perfect. #2 Enjoy a day on Bull Shoals Lake just 5 minutes away. Bull Shoals offers 1050 miles of shoreline perfect for boating, skiing, wake-boarding, scuba diving or swimming. Bull Shoals is a best kept secret in the Arkansas Ozarks with little boat traffic. Rent a pontoon for the day, jet ski, or paddle boards and enjoy the outdoors. You won't be disappointed. #3 Free of charge is a visit to the Jim Gaston Vistor center where you can view the history of Bull Shoals and the many fish attractions. You don't want to miss! Bull Shoals State Park is 2 minutes away for river fun rentals: 870-445-3629. Lakeview Cove Marina (Ph: 870-431-5291) are both 2 miles from the home for the lake enthusiast! Additional damage fees may be charged if home has been damaged.